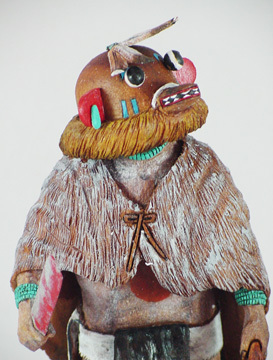 Yowi or Yowe is an Ogre Kachina. He may be regarded as a deity of certain Hopi Warrior Clans, having supremely powerful inner spiritual responsibility to punish including taking of life. 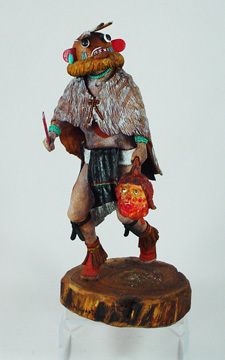 He is now referred to by the non-Hopi people as the Priest Killer because he carried out the beheading of the priest during the Pueblo Revolt in 1680. At that time, the Indians of New Mexico and Arizona revolted against the Catholic Church in an attempt to retain their religious freedom. 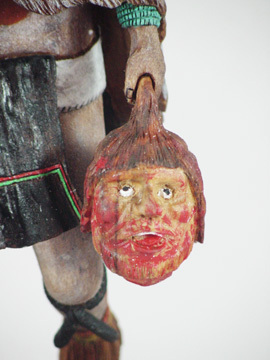 Legend states that a Hopi named Yowe killed and beheaded a Franciscan priest. 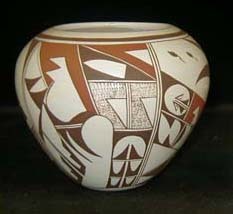 After this incident, the Hopi referred to Yowe or the Priest Killer as an Ogre Kachina that had the power to punish others. 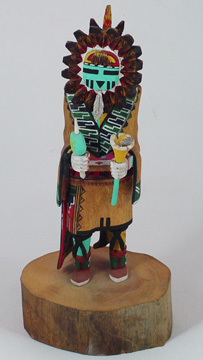 Count on your fingers the five best Hopi Kachina carvers, and Cecil Calnimptewa would be among the top three. 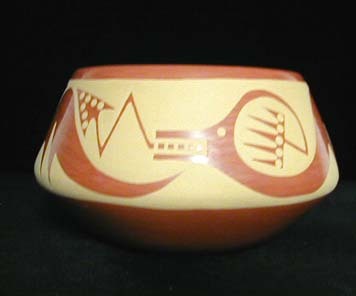 It would not be an exaggeration to say that Cecil Calnimptewa is synonymous with Hopi Katsina carving. 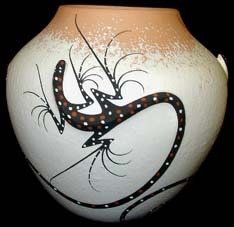 He is acclaimed because of his sculptured Kachinas, bringing motion, detail and accuracy to the figures he carves. He uses da Vinci-like muscle tone to bring out tension. The articulation of his figures combine with the swaying folds and tassels of the capes and kilts, defining action and grace. Indeed, a true artist. 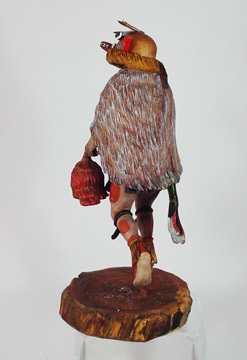 As stated in The Kachina Dolls of Cecil Calnimptewa, by Theda Bassman "Cecil Calnimptewa carved and sold his first Kachina doll when he was 18 years old. Since that time, he has become an innovator, teacher, and master of the art. His artistry is exhibited in the fine detail of belts, sashes, and garments as well as musculature, the motion, and active stance of the doll. He produces very realistic figures that have sheer aesthetic beauty and display tremendous power." Cecil Calnimptewa, Jr. was born in Moenkopi, Arizona, on January 1, 1950. 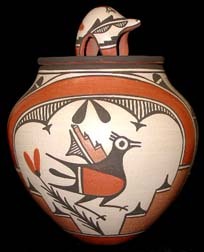 (Moenkopi is a Hopi "outlying village" just outside of Tuba City, AZ.) 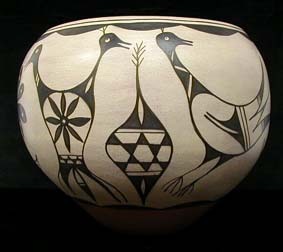 As a teenager, Cecil was first taught by his father, Cecil, Sr. Cecil says that his first real introduction to art was while going to high school on the Reservation. He then attended Haskell Junior College in Kansas for three semesters. He intended to learn a trade, but spent most of his time studying art, using both oil and water colors. He was then young and married, and went into construction as a dry-waller. 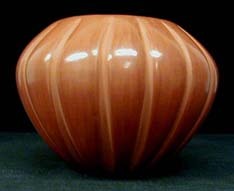 This lasted for 14 years, when he started carving full-time, mostly so that he could stay home with his family. His wife, Muriel, tragically died in 1991, as the result of pneumonia. The following are excerpts from a recent interview with Tom and Jay Tallant who visited Cecil in his home. 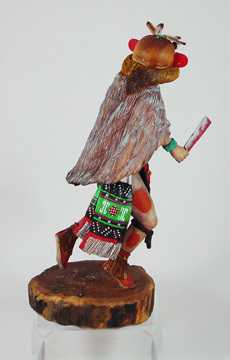 "Kachinas have changed a lot in the last nine to ten years, one-piece carvings are becoming more common. Real game feathers went out in 1975, with the government's Migratory Bird Act; so we have all had to adapt to all-wooden feathers. Actually, I think the figures are better now than back then. However, I and my dad started making all wood figures, before the government outlawed anything but domestic foul feathers. "We were also making one-piece figures back then. Today, I make all my figures one-piece, except the Eagle. 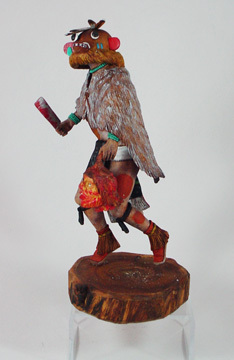 For that Kachina, especially the big ones, I have to make the wings separately. For one thing, my wings are thinner and more delicate than most carvers, and this can create problems.
" We grub out the big spaces with a hand router and a Dremel tool. We finish the work with an Exacto knife. We put a lot of the detail in with an electric burner.